Chairman of 'Agudas Chasidei Chabad,' Rabbi Yosef Yitzhak Aharonov, has called for Israel to allow the Indian caretaker who saved toddler Moshe Holtzberg from the besieged Chabad center in Mumbai to immigrate. Sandra Samuel grabbed the toddler, who turned two on Saturday, as terrorists stormed the ultra-Orthodox center and escaped with him in her arms. Both of Moshe's parents, Rabbi Gavriel Holtzberg and his wife Rivka, were murdered. "I've spoken to the people in India, we've asked them to arrange the visa. The request has also come from the emissary's (Holtzberg) father and Rivka's mother. At this point she's the only one the boy is responding to," Aharonov told Ynet. The Holtzberg family is keen to see the nanny, who is very close to the toddler, come back to Israel with him. Their only concern is the bureaucratic hurdle. Chabad spokesman, Rabbi Menachem Brod: "Rabbi Aharonov spoke with the grandfather and grandmother, and they both feel the nanny should come with the child. But there is paperwork to arrange. We ask the government to work towards bringing her here. Samuel is currently staying with Moshe at the home of Ehud Raz, the top security officer at the Israeli Consulate in Mumbai. 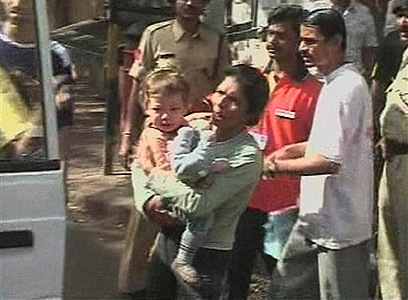 The toddler's maternal grandparents are also with him, having rushed to India from Israel as news of the crisis emerged. "In the evening his mother always puts him to sleep and now he doesn't understand what's going on," Samuel said. Regarding the attack on the Chabad center she said, "It was terrible, there were explosions everywhere, gunfire – they tried to shoot me." See all talkbacks "Chabad: Allow Indian nanny to immigrate to Israel"